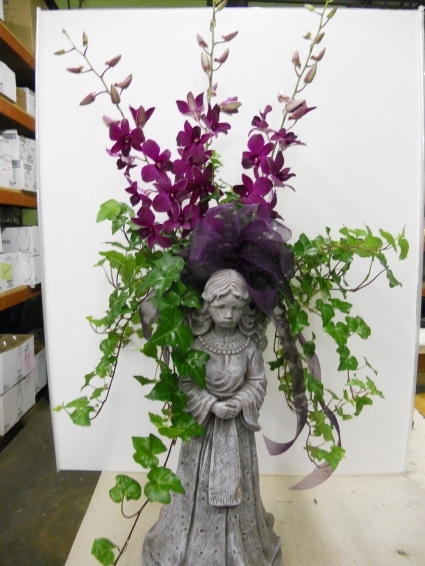 Our most popular sympathy gift, a beautiful cement angel with a planter between her wings, filled with a flowing ivy plant, fresh flowers are shown, with an organza bow. This is a ceramic marbled bowl filled with an assortment of green plants. It also has fresh roses added for that special touch. 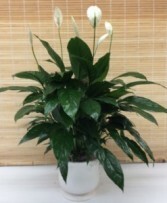 An easy care and very popular peace lily plant in a white porcelain planter. Great size (6" inside pot) for small sympathy tribute, hospital, apartment or desk. Choose the $44.95 option and we'll add fresh cut flowers and a bow appropriate for the occasion. 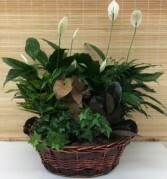 A huge magnificent display of assorted green plants in a 17" premium quality basket. When you need to make a statement this is your garden! Choose the $174.95 or $199.95 price points for lovely or awesome fresh cut flowers and elegant ribbon appropriate for the occasion.